Rhiannon didn't really plan it to happen, but somehow, over the years, she's managed to create a beautiful constellation of tattoos - and they suit her perfectly. How old were you when you got your first tattoo and can you tell me a bit about the experience? I was 21 or 22. It was a friend of a friend who I went to so it was very chilled. It was also only a little one so not too painful - in fact I don't remember it hurting at all! Maybe the years have affected my memory. All I remember is wanting to get more. I've definitely got an addictive personality when it comes to tattoos! 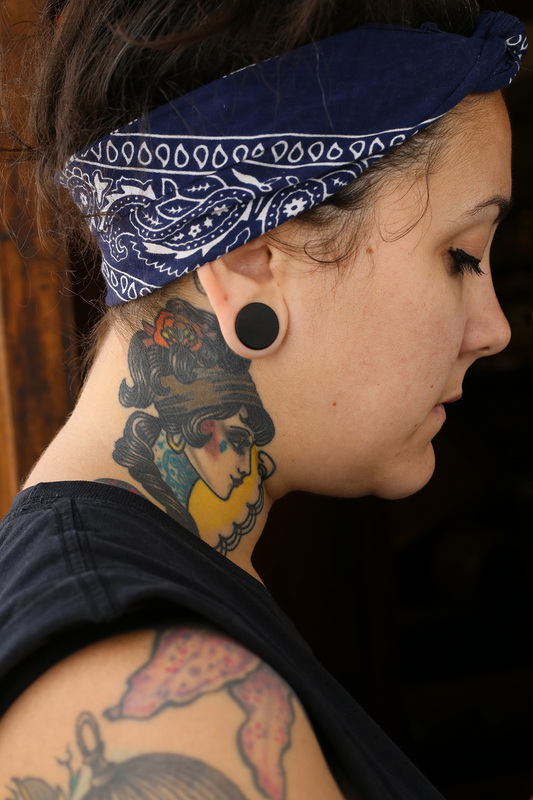 Can you pinpoint what it is about tattoos that you love and that makes you keep going back for more? I enjoy the process and the final outcome. I even enjoy the pain a little bit, I think! I've got to a stage where I've started to notice the blank skin more than the tattoos I have so I'm always thinking about what I can get next. Sadly, there's nothing really spiritual or meaningful behind my tattoos. I just really like the way they look. When you're settling on a design with your tattoo artist do you factor in the longevity of the tattoo? 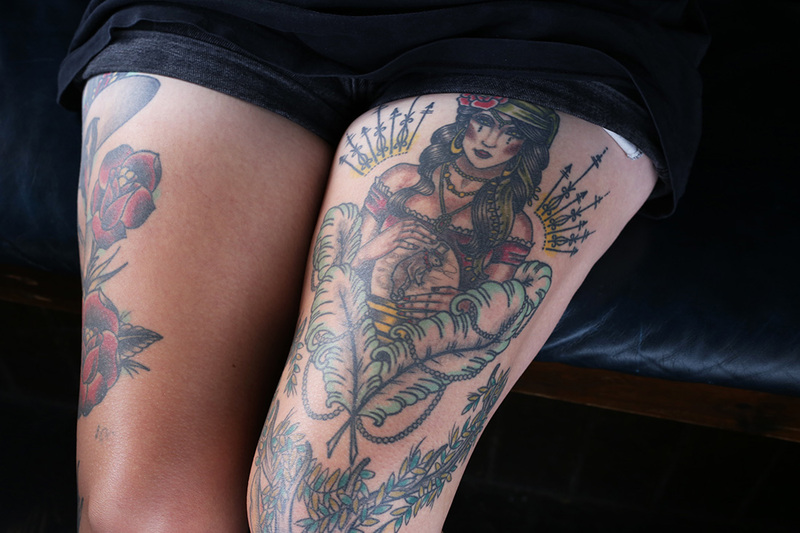 For example, do you go for designs and placements that will give the tattoo a better chance of ageing well? It's not really something I've put much thought behind. I'm more the kind of person who just goes for it, for better or worse! Luckily I think so far I've made some good decisions. It would be that people - sometimes - think we're a bunch of scallywags who don't have proper jobs! 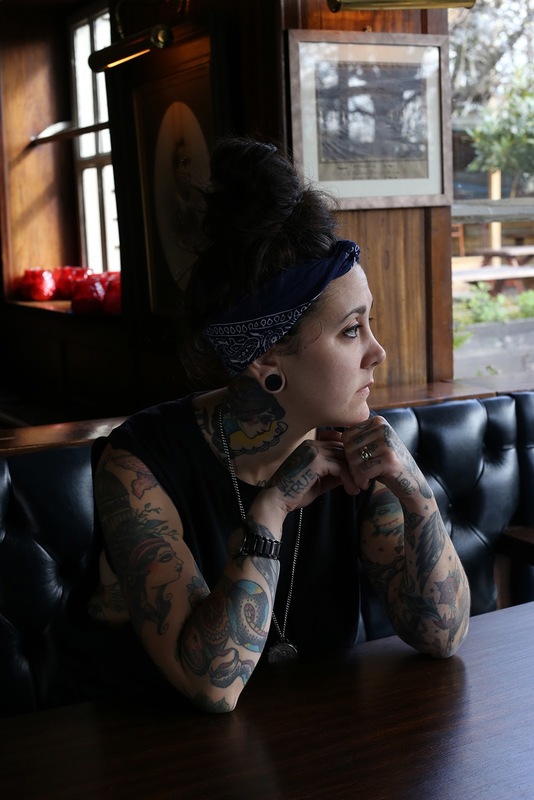 When you have a lot of tattoos people will always look, which is totally fine (we wouldn't get them if we didn't want to show them off), but sometimes you get quite disapproving looks from some people. Even if you don't approve there's no need to look down on someone for their choices. Live and let live y'know. We're not a bunch of dodgy types, just a bunch of posers, really! Haha. 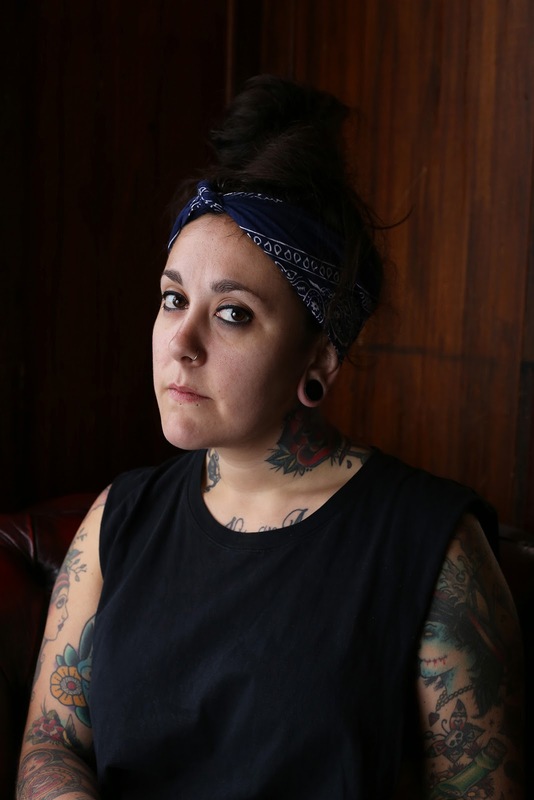 Has anyone ever actively discriminated against you because of your tattoos? How did you approach that experience? I once went for a trial in a bar job when I was backpacking. I had handed my CV in person, so they knew what they were getting, so to speak. 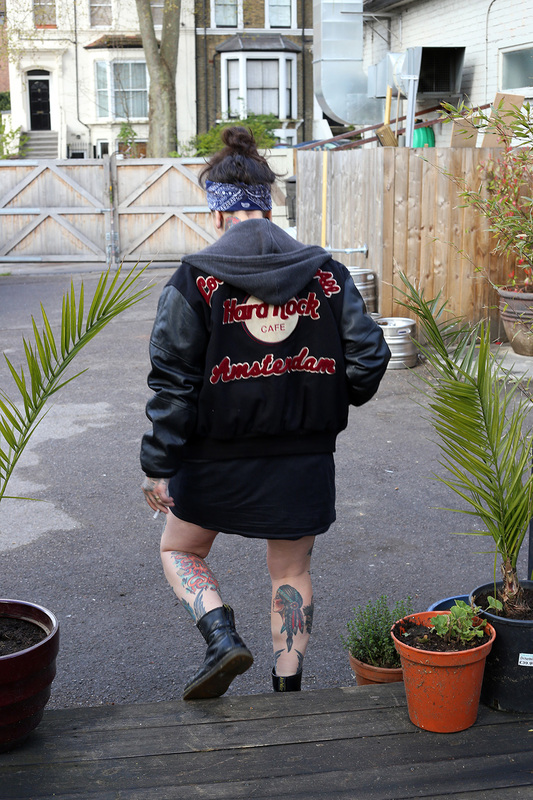 When I got there, I took my jacket off and the manager took one look at me and said: "Oh, you've got a lot of tattoos." I just laughed as it was in a pretty cool area of Melbourne, but it was obvious that he wasn't happy about it and then told me that it probably wouldn't work out. I remember being really offended at the time, especially as he had seen me earlier in the week. But I guess it was his loss. I ended up finding another job just down the road, where I met some really good friends, so everything happens for a reason, I guess! Is there a common theme running through your tattoos? I noticed you have quite a few of these amazing women in the American traditional style. Yes, I really love colour and that old school kind of style. Bright and bold all the way. 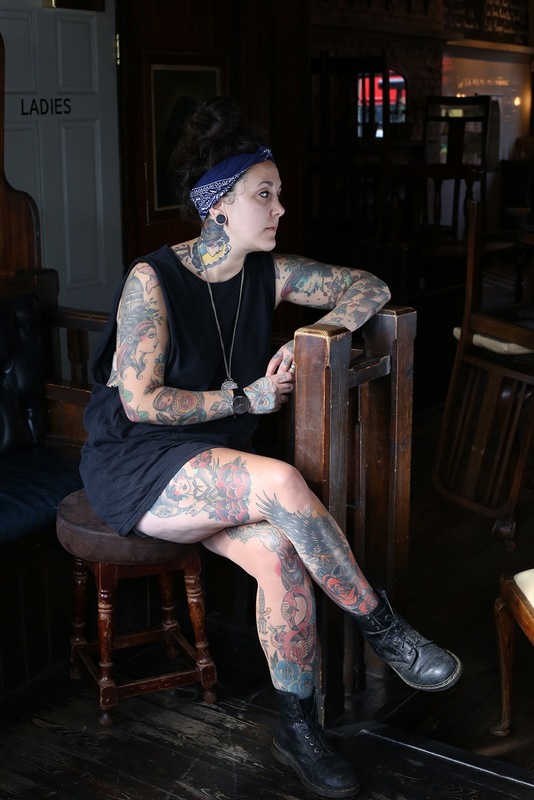 Do your tattoos symbolise certain things or do they serve more of an aesthetic purpose? I don't particularly have any meaning behind my tattoos. They are very much aesthetic. I just really love the way they look. I can't imagine myself without them!